Meet the handsome prince Zelos and royal maid Ana, two 15-year-olds from two very different kingdoms. This unlikely pair have Found themselves bound together by a magical curse, reducing them each to onLy 10 years of age. When Ana laughs or zelos cries, they can each return to their original age of 15…. but at the cost of knocking the other down to a mere 5 years old! Now, on the run from the villain who cursed them, can these two stop bickering long enough to find a cure for their condition… and maybe even save both their kingdoms from disaster? 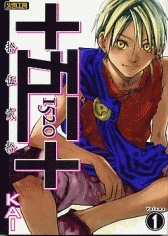 1520 was partially published in English by Udon Entertainment on January 25, 2009. After the first volume, the publisher discontinued the series.